With NVIDIA Control Panel, users can specify custom resolutions which allow end users to the ultimate flexibility to add virtually any resolution and refresh for their display. The following screen capture image shows the setting UI. When timing standard is set to manual, a custom video timing can be specified. According to the wikipedia, the front porch is a brief (about 1.5 microsecond) period inserted between the end of each transmitted line of picture and the leading edge of the next line sync pulse. Its purpose was to allow voltage levels to stabilise in older televisions, preventing interference between picture lines. The front porch is the first component of the horizontal blanking interval which also contains the horizontal sync pulse and the back porch. The back porch is the portion of each scan line between the end (rising edge) of the horizontal sync pulse and the start of active video. It is used to restore the black level (300 mV.) reference in analog video. In signal processing terms, it compensates for the fall time and settling time following the sync pulse. Therefore the horizontal blanking width is the summation of front porch, sync width and back porch. If want to find the back porch from Nvidia custom resolution setting in the above figure, the back porch = Total pixels - Active pixels - Front porch - Sync width. A modeline is a configuration line in xorg.conf or the XFree86 configuration file (XF86Config) that provides information to the X server about a connected computer monitor or television and how to drive it at a specified display resolution. 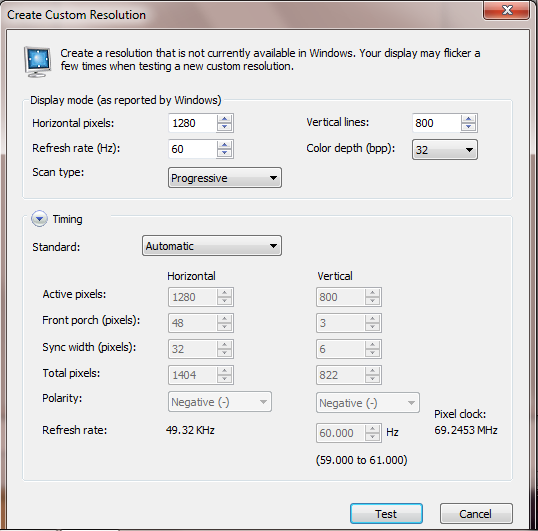 So a modeline settings can be calculated from a Nvidia custom resolution setting. EDID (Extended display identification data) is a data structure provided by a digital display to describe its capabilities to a video source (e.g. graphics card or set-top box).